One of the things that I absolutely hate doing is getting new electronic devices. On the other hand there is a sense in which we are invariably forced to doing so as electronics are designed to have a limited lifespan and there is the other factor of predetermined obscolescence. I had to get a new computer recently,well, I ‘needed’ it a year ago but was only in a position to get it recently. I was looking at specs of computers and remembering when I used to read PC magazines about 18 months ago and what were ‘hot’ features and what comes as standard these days. I found a desktop on ebay (used stuff eases my conscience) which had specifications that seemed absurd to me. 16GB ram (where the standard ‘high’ spec is 8) and a processor with 6 cores. It is a clear comparison that this machine was like an American Muscle car. There’s a lot of talk about the latest Apple announcement. The Cult of Apple’s press conferences seem to get more attention and interest than when the Pope makes a statement on a social justice issue. Plus Bono is linked to both institutions. I was thinking about the notion of a smartwatch lately and I felt unconvinced. The reasons are as follows: firstly, until the need has been ‘invented’, like my ‘need’ for a tablet computer that can check email anywhere at home. I currently work in an arrangement where responding to emails quickly gets me money and so my lifestyle has been oriented around the effiency of being contactable on email. The other issue is that I already have a watch. I liked the idea of a tablet because it added to my life in a way that genuinely made things easier. It did have a cost of course, of having to charge it all the time and the one time where I actually went back to work on a weekend to find my lost computer (never again, never again). As a man, a watch is one of those pieces of fancy bling that are socially acceptable and sanctioned without attracting too much attention. Such as wearing a chain might be considered gaudy or most jewellery in general seems gender subversive, but that’s a whole other issue. Watches have become for men signifiers of status and class, sometimes signifiers of what kind of person you are. I have to admit that one of the things I was socialised into was the cult of watch-fascination. I think it started from the fancy laser watch that Bond played by Pierce Brosnan had in Goldeneye. I’ve always wanted a laser watch and when that is invented and on a commercial market I will have a need invented for myself. The other aspect of the ‘cult of watches’ is the durability of a watch. I love automatic watches or watches that don’t need battery replacements. I’m attracted to the longevity of watches and in an age where everything is supposedly replaceable and designed to break, there’s the notion that getting something that can last is a statement against it. The idea of a watch that everyone else might recognise and have is contrary to the signifiers of watches as status-symbols. The iPhone has ceased to be a status signifier insofar as most everybody has one. Indeed it is true that watches can be prohibitively expensive signifiers and hardly the sort of thing that expresses a revolutionary temperament. I do like that my watch has been repaired a few times over the years. I do like that I can keep my watch if it is repaired and its functionality remains. I would really wish that we could own things that we could repair easily and upgrade with ease. Of course, that seemingly doesn’t make money for these brand leaders nor is it in their interests to make something that lasts. I remember hearing somewhere (probably from a comedian) that ‘it’s possible to make a toaster that lasts 20 years but nobody will make it’ because of the sudden loss of a market once everyone has it. There seems to me this fundamental tension, of having things that have amazing utility but in order to live in that economic zeitgeist, we must support the production chain of its production by buying it. I would wish there was an alternative to having to re-buy things every 3 years. I am bemoaning of a situation that I am very much contributing to and consciously so. I have so much electronic waste. First, all translation is an interpretation. Translating complex philosophical texts is much, much harder than figuring out ‘gavagai.’ This is so, even if you have written the text yourself and are fluent in both languages. You should try translating some time; even if you are not a meaning holist, you’ll discover that a lot of philosophical jargon is not stable and uniform across cultural and temporal contexts. (Surprisingly enough, this is even true of works in the history of physics.) So, leaving aside honest mistakes, all translations involve non-trivial judgments and trade-offs with a complex interplay among style, content, jargon, sentence structure, and even argumentative structure (this list is not exhaustive). 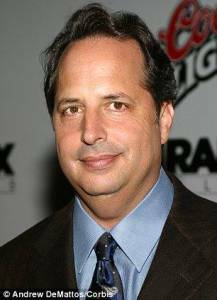 That’s David Hume and Jon Lovitz. 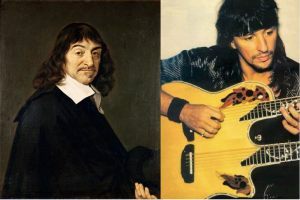 Descartes and Richie Sambora, of course. 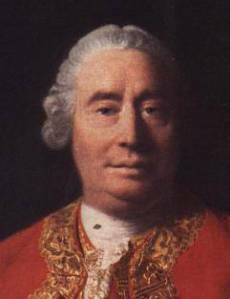 Your additions welcome in the comments, but let’s try to not insult any living philosophers. UPDATE: It turns out that it may be rather difficult, and perhaps impossible, for some people to add images in the comments as the site is currently configured. So if you mention the links to the images in the comments, I will add them to this post below the fold. For the past 6 months I’ve been trying to organise my music listening through some kind of ordered fashion. Sometimes I explore things through genres or sometimes I explore the complete corpus of a musician or composer’s work. This often requires said musician to be dead usually, and the hope that no new works or recordings are found. Early on in the year I began to listen to the early Jazz musicians. At points Jelly Roll Morton is indistinguishable to Ragtime, not dissimilar to how the likes of the Rolling Stones were very much in the feet of Rhythm and Blues (as opposed to Rock), or Black Sabbath’s Black Sabbath could easily be seen as a Blues song. I recently discovered John Coltrane and reading bits about him and I thought I would listen to contemporaries. Coltrane’s work has often been associated with Bebop or hard bop. I decided to check out the wikipedia page and find who were his contemporaries. I listened to the likes of Al Haig, Lee Konitz and Walter Davis Jnr and the only similarity they have to the eminence of Coltrane is that they happened to live at the same time as he. Are they stylistically similar? There is an extent to which they are. But Al Haig and Walter Davis’s recordings are exceptionally pedestrian compared to the freedom and rule-breaking of John Coltrane’s tenor sax work. Coltrane’s playing classifies as genius. I can hear how the saxophonist simultaneously invents new forms of expression, exploring modalities and at the same time smashing the new forms of jazz tonalities that he has invented, through the dissonances and tangentially related melodies to the background harmonies. Coltrane elevated the potential for Jazz to heights that the contemporaneous classical art music would wish to aspire to at the time. With the mid-century movement of neo-classicism and the more simplistic forms such as minimalism, it could hardly be said that some classical music aimed to be daring or avant garde. Coltrane stands as the example, to me, of an eminent form of expression that a critical perspective on culture should acknowledge. If Adorno followed his own principled objections to mass culture consistently I would have thought that he was correct about the blandness of much of Jazz — except when the bright stars such as Coltrane appear. Coltrane moves beyond the standard boredom of chord progressions and the formulaic character of Jazz that makes everything so samey. The experimental nature of using modes and improvising in what appears to be atonal is evocative of Schoenberg. But I have been insisted upon by many commentators that Coltrane’s style emerged independently from any influence from the second Viennese school. In the hopelessness of Adorno’s cultural picture of the world, I would contend that Coltrane, and figures like him, provide cultural, and moral hope. This weekend I had the lucky opportunity to see La Boheme, of HeadFirst Productions. I saw the production at LOST Theatre in South London and was quite impressed. The composer was one Kelvin Lim and the Opera was Directed by Sophie GIlpin and designed by Jason Southgate. The Opera was led by 4 musicians. At first I was concerned at how thin the textures might be musically given the acoustics. On the other hand it sort of reminded me of how this presented a very authentic and historically resonant challenge as a performer. At times the singers matched the fortes and fortissimos and the less said about a high latency digital piano against an acoustic one the better! The instrumentation was daring and scoring worked sufficiently well. I was impressed at the power of the characters. Although I do not find the story of La Boheme as convincing as a tragedy and love story, the farcical nature of parts of it were excellently carried by the ensemble. I could tangibly grasp the 19th century cultural Italian humour of it and in some ways, even if I may critique or challenge it, I must say it does very much chime in with the blokey bravado and the men of our age and, perhaps many of us know a Musetta in our own lives. I was taken by the technical prowess of Mimi’s vibrato, which definitely moved the audience. Basses were very powerful too. I couldn’t help but consider this production more of an etude or technical study, of how to overcome space and time. In this regard of space, they succeeded in making a very small musical ensemble fill the acoustics of the physical space, I think that the doubling (in terms of scoring) role of the Clarinet worked spectacularly. The use of an Eb (sopranino) clarinet was masterful. In trying to bridge a gap of time, however, between 19th Century Italy and today? I think the verdict of the audience was that of a success. In most of the press releases about this production, the ending is already given away: Mimi’s death is not of TB but of a drug related incident. As the story reaches its end, it begins to seem very dark and less like the 19th Century but more the malaise of our present day. I was not sure of the use of modern substance abuse as a supplanting theme to the 19th Century artist-hero archetypes that La Boheme explores, in doing so it tells a different but perhaps more important story. Furthermore, I was kind of thrown off a bit at the use of actual cigarettes on the stage! I initially thought they were vaping ones but there were actual roll ups! Not a good time to be given an inhaler for the first time this week I must say.